The single best thing you can do to speed up your cooking process is keeping onions in the freezer. Seriously! This simple habit has changed the way I cook meals. 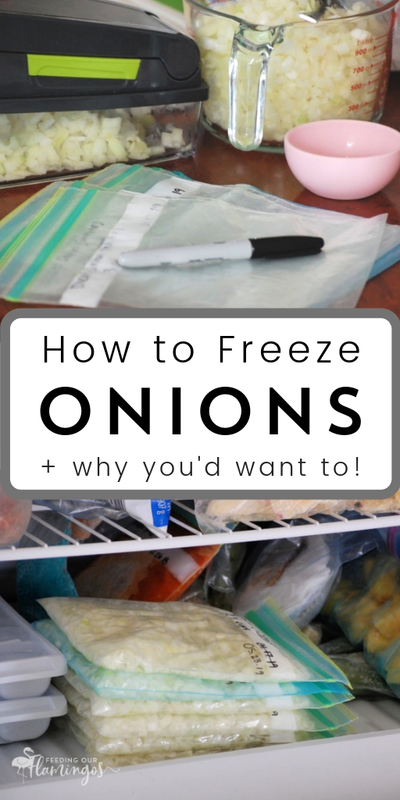 Read on to learn how to freeze onions and get dinner on the table faster! The last time you cooked with onions, can you honestly say you enjoyed chopping them? Or did you have to force yourself to get it done just so you could cook dinner? Of all the kitchen tasks I do on a regular basis, chopping onions is the one task I dread the most. The tears, the smell, the time it takes to get the onion chopped, all of it just makes me want to teleport myself out of my kitchen to an island far, far away. I think you get the idea that I really could do without chopping onions in my life. For something I so passionately hate, why would I be writing an article about how to freeze the darned things?? I’ll tell ya. I’ve actually become much more fond of cooking with onions lately. Well, it’s got everything to do with freezing them. Now I get to impart my onion-freezing wisdom to you, friend, so you can enjoy cooking with onions once and for all. Why would anyone want to freeze onions?? First things first, who in their right mind would want to freeze onions when you can generally chop one in less than 3 to 4 minutes? (me, jumping up and down, raising my hand really high) I would! I would! For starters, when you chop onions for the freezer you will be using a kitchen tool or appliance that will make it much faster, easier, and pretty much eliminate all tears. For me, that’s big enough reason to freeze all the onions. If you’ve been around these here parts very long, you may have seen a recurring theme with the content I write. 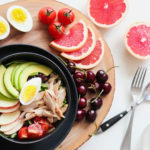 I am trying to help you save time in the kitchen. Thus, saving time is pretty much a huge requirement if I’m going to post about it. This post is no exception. 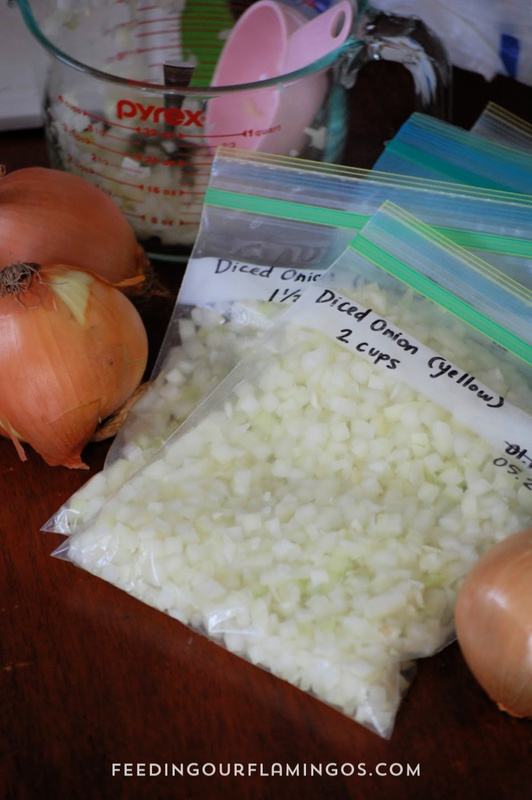 By bulk chopping/prepping your onions for the freezer, you are saving so much time down the road. When you chop onions for the freezer, it takes less time overall than when you chop onions one by one. Think about it. Say you have to chop 4 onions this week for various meals. Each night you cook, you chop one onion. It takes about 4 minutes from start to finish and then you also have a cutting board and knife to clean. Overall, you are spending about 28 minutes for the week preparing 4 onions. Now, say you knew you’d have 4 onions to prep for the week, so you decided to bulk prep and freeze. You went ahead and chopped 5 more to freeze for even more added convenience later in the month. It took a matter of 15 minutes to chop them all because you used your trusty food processor. And you didn’t even shed one tear. BOOM! You just cheated the system. And once your onions are nicely packaged in the freezer, you won’t think twice about getting takeout because you know part of your meal prep is already complete. You just grab a bag of onions from the freezer and dinner is at least started. Bulk prepping onions for the freezer can help lower your grocery bill, even if just a little bit. When you see onions for a better price, buy more of them and spend some time getting them all ready to go in the freezer. 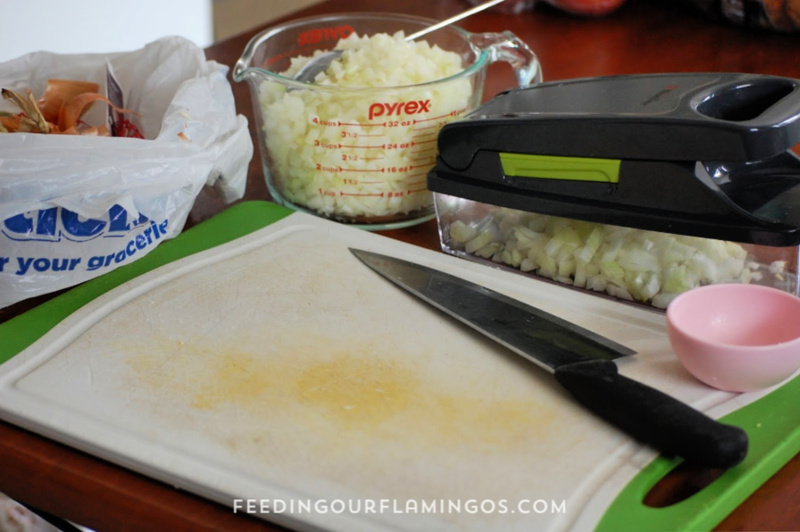 Ever seen diced onions in the freezer section or in small containers in the produce section? While these are fairly convenient options, they aren’t exactly cheap. You can definitely save money by buying the onions and chopping them yourself. Finally, you will save the most money just by the fact that you are not getting takeout or going through the drive-thru. If you have onions ready to go in the freezer, you are less likely to back out of the meal you planned and just make it. I’ve done it, you’ve done it, we’ve all done it. We buy a bunch of onions because they are a great price and then end up throwing out at least half because we couldn’t get to them in time. Not anymore, love. You and I now know that if we buy plenty of onions we can freeze most of them and food waste has been significantly reduced. BAM! 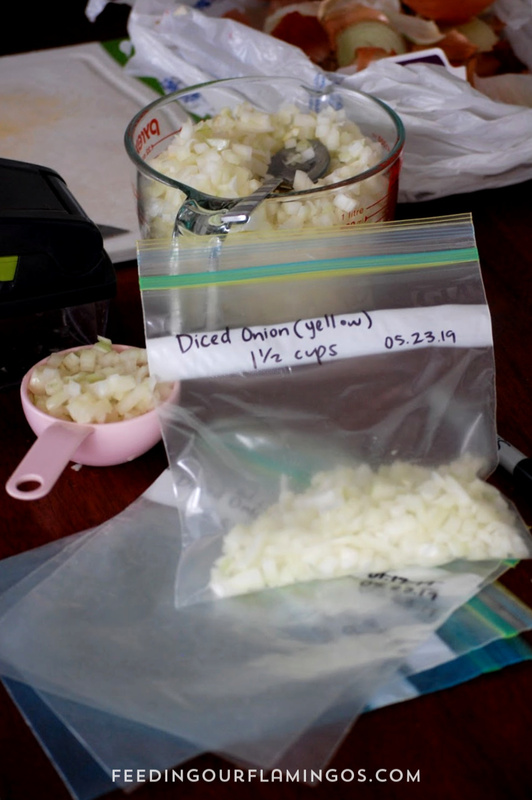 For all these reasons, I have really come to love bulk prepping diced onions for my freezer so I can generally avoid the task on any given weeknight. So whether it be to reduce tears, save time or money, or just stop throwing away so much food, it is a very smart move to freeze onions. You can prepare onions two different ways for the freezer: chopping or slicing. You should store the onions in the freezer the same way you would like to use them when you get them out. Well, what about just throwing a whole onion in there? Maybe you have an onion that is starting to sprout and you think that if you throw it in the freezer it will stay edible so you can get it out some other time and use it. Unfortunately, from all my research, I couldn’t find a definite answer about freezing a whole onion. Most likely, though, you should only freeze an onion whole if you plan to use it whole when you take it out of the freezer. For example, if you like to put an onion in the cavity of your chicken or turkey or if you like to use onion to make chicken stock, why not? Right? But, if you are thinking you will chop the onion when it comes out of the freezer, just stop right there. The onion will be much more difficult to chop once frozen. At least, that’s what I would imagine. So spend a little time to chop it first and then freeze it. Now time for the nitty-gritty. Let’s dive into how you go about freezing onions. In the past 5 months or so, I have done three onion chopping sessions (it all started with my very unscientific experiment to find out how long it takes to chop an onion). In between those sessions, there were a few times I had to chop onions on the spot for whatever recipe I was cooking, because I didn’t have any frozen onions left. And, let me tell ya, I highly prefer doing a freezer onion chopping session. For a freezer chopping session, you will first want to decide how many onions you are going to chop and freeze. Decide beforehand the way you will chop them as well. Are you going to dice all of the onions or will you do some in slices? I like to keep at least 2 onions out of the freezer for times when my husband wants Tomato Onion Salad or just wants to eat a raw onion with his meat. I also occasionally make salsa or other dishes that require raw onion. If you make dishes with raw onion, consider doing the same thing. For your very first freezer onion chopping session, only do 3 or 4 onions so you can decide whether or not you even want to continue freezing onions (um, I’m really not sure why you wouldn’t, but just in case). 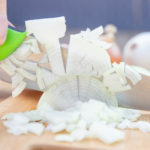 You won’t be chopping the onions yourself if you’re going to dice them, but you still need a knife and cutting board to get the ends off the onion and cut them into halves or quarters for the food processor or onion chopper. If you are using an onion chopper, you might want to chop one onion at a time and store the diced onion in a bowl until you finish with all the onions. Arrange everything the way you want it before you start. Now you can start doing your thing. 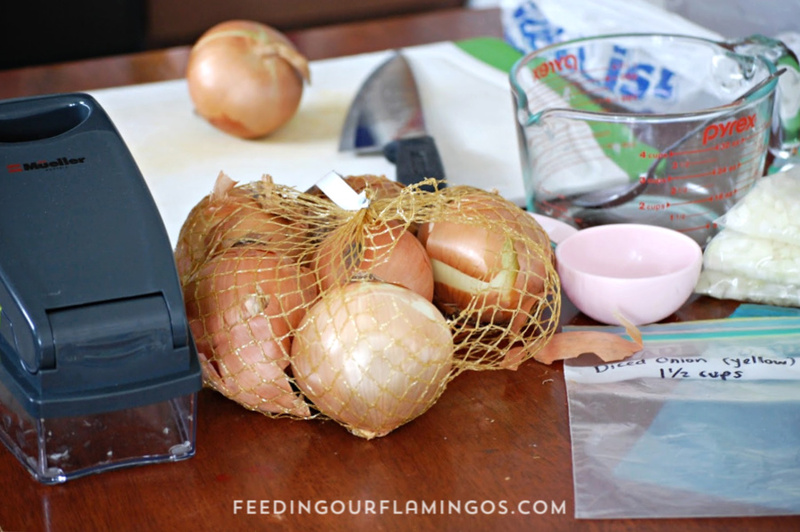 If you’re using a food processor, get all the onions ready to go (i.e. peeled and halved or quartered) before starting. How many onions you can chop at a time will largely depend on the size of your food processor. 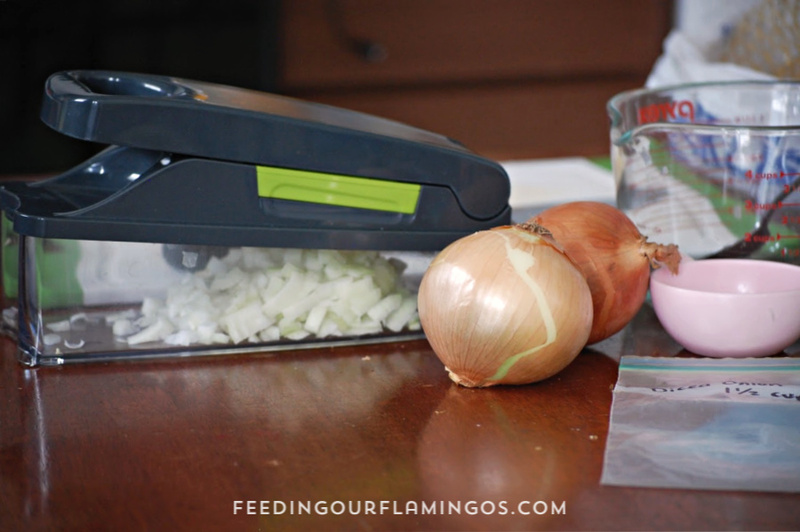 Start with just a couple quarters of onion if you own a small food processor. Own an onion chopper instead? You’ll probably only be able to chop one-quarter of an onion at a time. 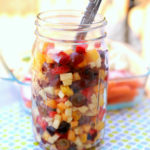 Once you get through 4 to 6 quarters, you can empty the container below the chopper and add it to your bowl. My guess is that, unless you are slicing your onions or have extremely potent onions, you will get through this part very quickly without shedding a single tear. Okay, now your onions are chopped or sliced and you’re ready to get them into the freezer. First, you’ll need to label your bags. It’s easiest to write on the bag before you put the onion in it, which is why this step comes first. Now you can start putting your onions in the bags. You can put a set amount in each bag (i.e. 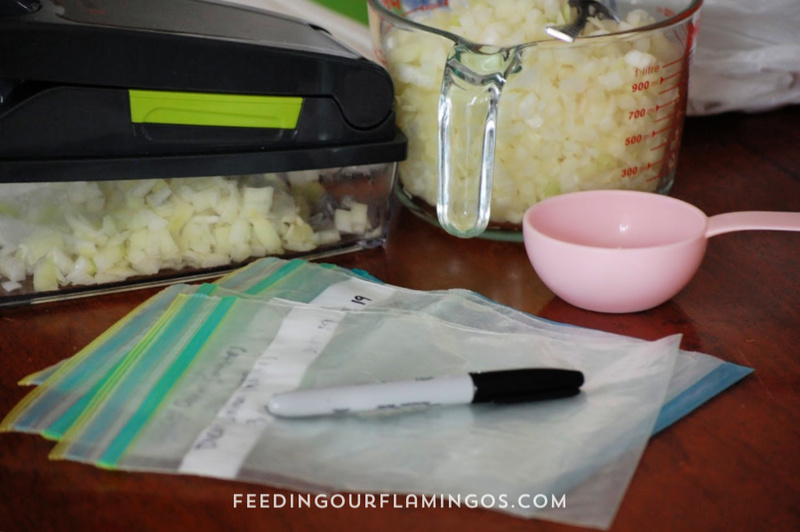 2 cups) or you can put one diced or sliced onion in each, which will change the amount you will label the bag with for each one. For example, if I chopped one small onion, I would measure how much onion there was and label a bag with the amount. The next onion would have a different amount so there would be a different amount for that bag. 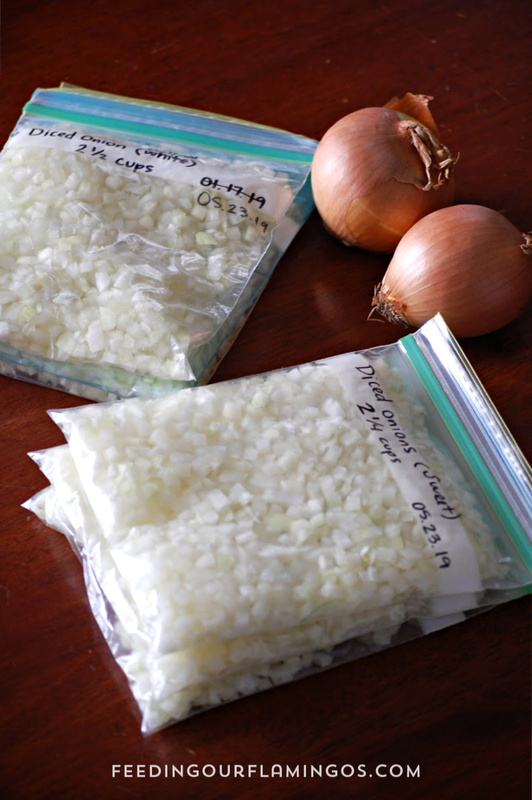 When your onions are in the bags, you can remove as much air as possible and close them tight. I like to push the onions down flat so I can stack the bags in the freezer. 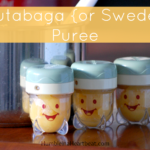 This also makes it so much easier to break off small amounts of onion as needed. Okay, now that you have onions in your freezer, you need to know how to use them for your meals. When you are making a meal that calls for diced onions, all you have to do is grab a bag of onions from the freezer and use it just like you would if you had just chopped them. 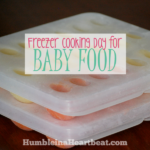 You shouldn’t have to take them out of the freezer ahead of time to thaw. At least, I don’t do that. When you are adding the onions to hot oil, be sure you are prepared for the oil to splatter and attack! Because the onions are frozen and the oil is piping hot, you are going to get a wild reaction. Finally, if you have measured your onions and put, say, 2 cups in each bag, you might be lost when a recipe calls for a medium or large onion. This is the general rule of thumb I found when I have chopped onions and measured them. 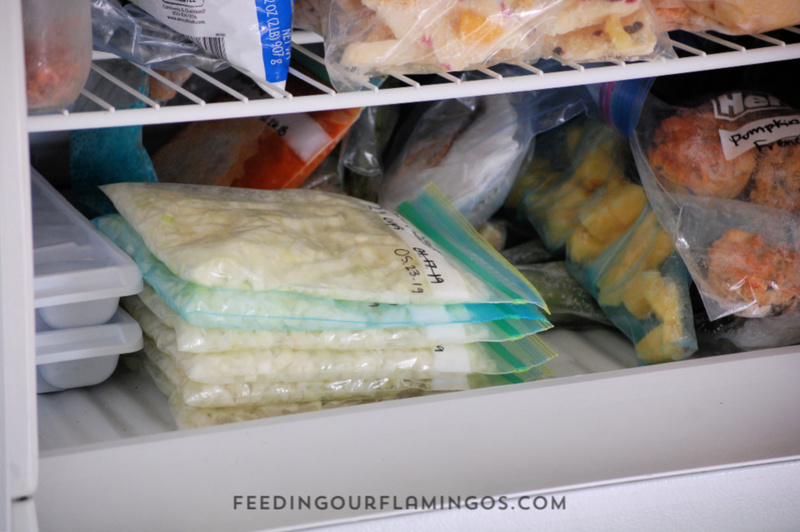 You can definitely reuse your freezer bags to save a little money and send less waste to the landfill. I just make sure to only use my onion bags for freezing onions and nothing else since they can smell like onions for a very long time. If you only need a small amount of onion for a recipe, just break some onion off and dump it out. You might want to write on the bag how much onion when you do that. 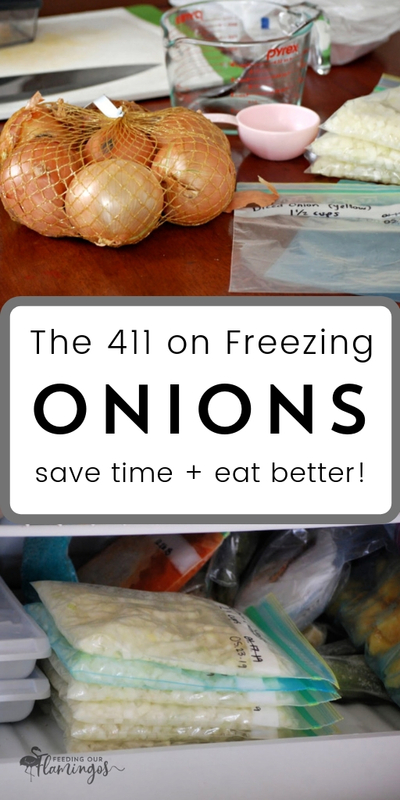 You probably have some more questions about freezing onions, so I have addressed some that I had when I first started doing this. Do you need to blanch them? From my research, I’ve found you don’t need to blanch onions before freezing them. This can be a huge concern for some people, and others, like myself, don’t really mind the smell. 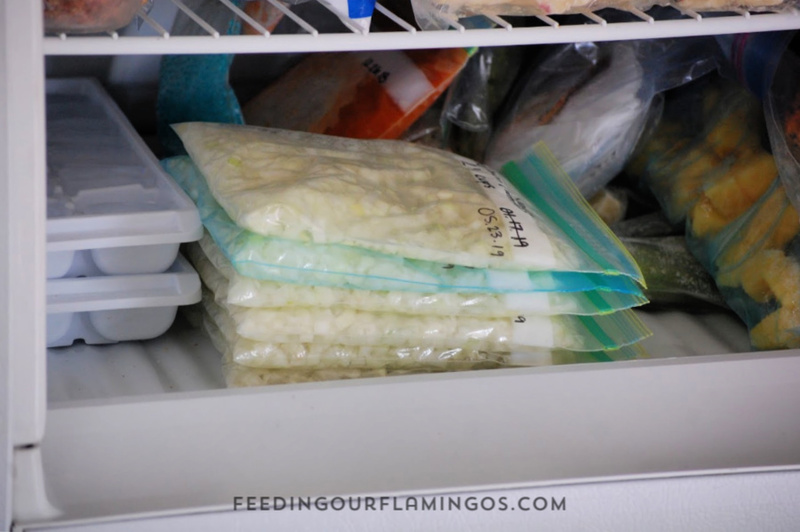 If you don’t really care, you can use one freezer bag to store the onions and then keep all the bags of onions in one spot in your freezer, away from things that could potentially be affected by the smell of the onions, like fruit. You will just have to realize that the onions may cause your freezer to stink for about a week after you store them in there. In my experience, the fridge doesn’t smell if it’s attached to the freezer where you’re storing the onions. If you are concerned about the smell, there are a couple of things you can try. If something doesn’t work, try something else! Can you freeze onions with other vegetables? Yes. You can easily freeze onions with peppers or onions with celery. If you already know you want to use onions with some other vegetable in the near future, you can freeze them together. However, it might just be easier to store them separately so you can easily use one or the other at any time. How long can you freeze onions? The standard for freezing most vegetables is about 3 months. If you cook at home most of the time, you’ll probably be able to use all the onions within a month or two. Be aware that the taste of the onions may be altered somewhat after spending too much time in the freezer. Can you use frozen onions in fresh dishes like salsa or salad? No, you should only use frozen onions in dishes where you will be cooking them. The texture of the frozen onions will be different than fresh, so you won’t want to use them in anything where they will be eaten raw. It’s really rather satisfying to cook a meal without having to chop an onion first. 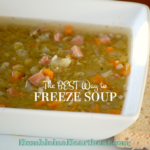 While, yes, you do have to put forth some effort up front to make it work, you won’t believe how much easier it is to cook when just one ingredient is ready to go in the freezer. I’d love to know, have you been freezing onions or will you now that you know more about freezing them?